This meeting is your opportunity to meet Cresset customers, partners and staff. Invited speakers from 4 continents will share their experience of Cresset technology. Our in-house experts will present the latest software developments, including a showcase of our new structure-based design application, Flare. 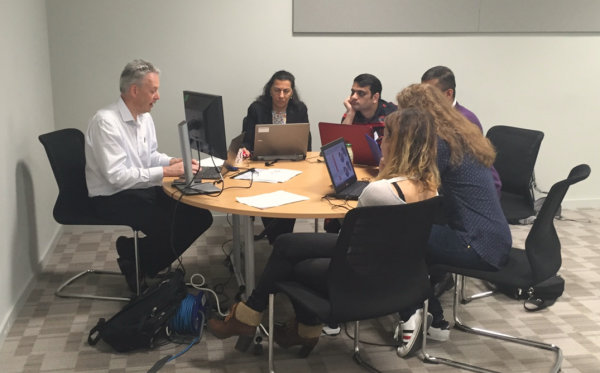 Hands-on software workshops for computational, medicinal and synthetic chemists will include Flare, Cresset’s new SBDD application, advanced ligand-based design with Forge, advanced scaffold hopping in Spark, as well as sessions on virtual screening and QSAR. As 2017 marks the 15th anniversary of Cresset we will celebrate the continuing work of Andy Vinter and the company he founded. Whether you are new to Cresset, or whether you have been with us from the beginning, I look forward to seeing you there. We are delighted to welcome all speakers to present in-person. All workshops are fully booked. Contact us to if you would like to go on the stand-by list. Who should attend: Computational chemists interested in new applications and techniques in structure-based design. In this workshop we are offering the opportunity for computational chemists to meet and use Flare, our new structure-based design application. We will be giving a hands-on session that will introduce all the key capabilities of Flare and their applicability within small molecule discovery projects. These include the calculation of the electrostatics of the protein active site, calculations of water stability and locations using 3D RISM, energetics of ligand binding using WaterSwap, docking of ligands with Lead Finder and the minimization of protein-ligand complexes with the XED force field. Who should attend: Medicinal chemists interested in new applications and techniques in structure-based design. Flare, our new structure-based design application has many features that molecule designers will find invaluable. In this workshop we will focus on the Flare workflows and processes that are particularly useful for users who are primarily interested in design. We will show how to use results from other Cresset applications, Spark and Torch within Flare to identify novel molecules with the right balance of properties to move your project forward. Who should attend: Computational chemists interested in finding new hits through virtual screening. Learn to use Blaze Cloud to find new hits and leads for your project. See how to interface Forge to Blaze to enable search submission and result retrieval from within Forge. Learn to identify the optimal set of query molecules and how best to combine results. See how the use of constraints and protein excluded volumes can focus the results towards the compounds with the highest probability of success. Combine Blaze’s ligand-based approach with docking with Lead Finder to give the best hit list possible. Using the Activity Atlas models and the Activity Miner interface of Forge, explore how to rapidly decipher the SAR of a series of molecules. This workshop will highlight an efficient workflow, detail how to identify outliers and generate meaningful summaries of SAR for use in molecular design in Torch or Forge. Using Forge we introduce Cresset’s methods for developing 3D and 2D-QSAR models. We will show how to build multiple models and choose between them, interpret 3D-QSAR models, use the models to predict activity for new compound design, and use the visual feedback to improve compound design. Explore the advanced options in Spark that will transform you into a power user. Topics include using excluded volumes and field point constraints to incorporate relevant protein information in the search, advanced search options including use of substructure filters, how to set up fragment growing and water replacement experiments. You will learn to use electrostatic and shape properties to understand the wider implications of molecular design, ensure that new designs make sense in 3D, and use electrostatics to add greater novelty to your projects. You will learn to optimize more than potency using a single scoring function that represents the fit of your new designs to your project profile. From the study of DHFR inhibitors and Porphyrin ring stacking to structure-based design, Cresset continues to innovate and evolve. Throughout we have sought solutions to drug discovery problems that can be employed using current technology. Learn about the origins and future of Cresset. This is the formal release of our much anticipated structure-based design application, Flare. I will show how the novel methods are combined into the final application, discussing the application architecture and demonstrating the novel interface. You will see how you can seamlessly combine local and remote compute resources to minimize calculation times whilst maintaining flexibility and give examples of its use on some popular targets. Cancer Therapeutics CRC (CTx www.cancercrc.com) is a public private partnership research organisation focussed on delivering new small molecule cancer therapies. CTx operates an innovative collaborative business model with leading internationally renowned research institutes and academic partners and is able to draw upon the world-class research reputation of those scientific partners and their expertise, including discovery capabilities that combine cutting-edge cancer biology, high throughput screening and industrial class small molecule medicinal chemistry. With the costs of high throughput screening rising and new target portfolios requiring new chemotypes, CTx acknowledged the need to expand its lead discovery efforts into the realm of virtual screening and in silico drug design. In 2015 CTx entered into a collaboration with Cresset to access XED platform technologies. This presentation will describe how we approached these challenges, the workflows we have established and outline some of the successful outcomes from the first year of operation. The OIDD Screening offering from Lilly’s Open Innovation Drug Discovery program enables structure-blinded submission of compounds for experimental evaluation in Lilly’s proprietary biological assays. Results from the assays inform next steps towards further collaborative work. Automated generation of molecular descriptor and similarity profiles for structures submitted through the web-based interface are used to determine if Lilly requirements for acceptance are satisfied. The entire process is run structure-blinded, where only the results of the in silico analysis, and not the actual chemical structures, become available to Lilly. Whilst endeavouring to evaluate every submitted compound in as many biological modules as possible, certain modules are based on in vitro primary assays which have capacity constraints. In such cases, Lilly utilises Cresset™ Blaze to run in silico models and to calculate a ‘score’ representing the likelihood that a given compound will show activity on a certain target before going through the corresponding primary in vitro assay. The Blaze virtual screening system approaches the task from the viewpoint of molecular interaction fields; two molecules are similar if they have the same shape, electrostatic potentials and patterns of hydrophobicity. Molecules with very different 2D structures can still be scored as being highly similar using this method. The normal Blaze method requires access to both molecular structure, and the calculated molecular interaction fields with their extrema (called ‘field points’). For the OIDD project, Cresset have developed a variant of the system that does not directly compare the molecule’s structure to the reference ligand, allowing the Blaze method to be applied to the OIDD database, giving accurate 3D shape and electrostatic scoring whilst maintaining the internal OIDD information firewall. I will look at the new Cresset methods in Flare, Forge and Blaze and the science that underpins them. I will present the results from our extensive validation studies and look at best practice. Recently AbbVie embarked on an initiative to completely revamp the fragment screening collection. When we first assembled our fragment collection, well over a decade ago, little was known about what constitutes an ‘ideal’ fragment, indeed our fragment deck predated Ro3 dogma, with little attention attributed to the physicochemical properties of the collection. Although the jury is still out with respect to the validity of confining fragments to Ro3 space, we reasoned that we should at least try to define where our collection ought to lie in terms of overall physicochemical and other property space. In addition, the collection had more than its fair share of ugly and intractable fragments, therefore we embarked on an initiative to completely overhaul the fragment collection. This presentation highlights some important design criteria and analyses that formed the basis of the strategy employed for re-vamping our fragment collection. Disclosure: Phil Cox is an Employee at AbbVie. The design, study conduct, and financial support for this research were provided by AbbVie. AbbVie participated in the interpretation of data, review, and approval of this presentation. As part of our effort to better address target-ligand interaction space with new chemical matter, BioBlocks is developing the Comprehensive Fragment Library (CFL). This library of small, rigid, medicinally interesting fragments originates from a starting set of >3 million potentially synthesizable virtual fragments with synthetic handles and ≤18 heavy atoms. Because structures with actual commercial availability provide a poor representation of the overall set and can be grouped into a disappointingly small number of hydrogen-bond interaction chemotypes, most of the compounds that populate the CFL require de novo synthesis. Details of the physical library design, including 2D and 3D compound clustering by Cresset and hydrogen-bond pattern analysis will be discussed. Compounds were selected from separate clusters to maximize diversity. Screening CFL compounds from the first plate in an established enzyme assay revealed both typical and novel chemotypes. While the first screening results indicate a lower hit rate than observed for more conventional 2D libraries, hit compounds show wider structural variation. In this talk, we will also estimate the size, complexity and coverage of accessible fragment space. We will provide evidence that an enormous amount of new chemical matter is still available for drug discovery, and that the fragment methods used in our platform provide the most efficient access to these compounds. Can Cresset Tools Inform Fragrance Molecule Design? The design of fragrance molecules offers unique challenges to chemists. Small changes in molecular structure often change or abolish odor character. Many odors appear to have multiple pharmacophores. Although fragrance receptors are the largest family of Class A GPCRs, many of the receptors remain orphans. Only a small proportion of molecule-receptor associations have been elucidated. Molecular design is consequently limited to ligand-based approaches, with many unknowns. However, an assessment of molecules that share odor character can often derive common structural elements that can aid in the design or interpretation of odor character. Field-based alignment tools can be helpful in this effort. I will discuss the use of Forge and Torch to explore structure-odor relationships, and will also describe the use of Pipeline Pilot components to create an integrated alignment tool and reference structure repository. During the past years an in silico ADMET IT platform has been built up at Bayer Pharma. The platform consists of various physicochemical and ADMET prediction tools and is seamlessly integrated into Pix, our pharmacophore informatics software which is accessible to all scientists working in the early phases of drug discovery at Bayer. An overview of the individual components will be given. Certain combinations of tools and scenarios to predict drug-like properties and to guide hit-to-lead and lead optimization will be discussed. Application examples will be shown and an analysis of the tool’s impact will be presented. What’s New in Ligand-based Design at Cresset? I will introduce the latest enhancements in the recent and upcoming releases of our ligand-based design applications Forge, Torch, Spark and Blaze. I will discuss the latest developments in the fundamental algorithms including the use of pharmacophore constraints and our updated substructure alignment protocols. As always I will use case studies and where possible live demonstrations to exemplify how the new science will benefit you. Given that the organic chemist’s transform compendium increases year by year how can we couple those advances in synthetic chemistry with the desire for novelty and excellence in small molecule drug design? Molecular design tools will often use a subset of reactions or a cut down set of medchem transforms which rarely take advantage of the full breadth of transformations and reagents available. With access to a full suite of synthetic chemistry options how can we answer the question –What should I make next? This talk will describe how we can use Chemistry ELNs and reaction databases for in-situ fragment growth and compound design using the reaction vector approach. It will highlight some of the options and issues associated with multi-objective optimisation and scoring of designs and will introduce the use of reaction networks that aim to overcome such issues. Alongside several examples the webGL application framework will be discussed. Binding free energy methods allow computational chemists to predict whether or not changes to a ligand increase or decrease its binding affinity to a medicinally important protein. While these methods can reveal whether or not a change to the ligand increases its binding affinity, they provide little information as to how this change affects individual molecular interactions. Such information would be extremely useful, as it could provide feedback to a drug designer that could inspire the next series of ligand modifications. For example, it would be valuable for the free energy calculation to reveal that addition of a hydroxyl group to a ligand strengthens its interaction with an active site aspartate residue, but simultaneously destabilises a water molecule that bridges between it and the protein. This feedback could inspire a drug designer to investigate ligand modifications that combine addition of the hydroxyl group with the addition of moieties that displace the bridging water molecule. We have developed a range of binding free energy methods, based on WaterSwap. These swap-based methods allow calculation of absolute and relative protein-ligand binding free energies using a single simulation over a single λ- coordinate. Use of a single coordinate allows components of the binding free energy (i.e. specific interactions between the ligand and individual active-site residues, or between the ligand and neighbouring water molecules) to be integrated across λ during the simulation. The resulting components are used to colour-code 3D views of the protein- ligand system. This allows drug designers to easily visualise the affect of ligand modifications on the interactions between the ligand and individual residues in the protein, and individual water molecules in the binding site. These components are not true free energies. However, what they reveal is chemically intuitive, and provide a level of insight that allows drug designers to suggest modifications that lead to improved binding affinity. The components show co- operative affects, and also reveal how increasing the strength of interaction between a ligand and active site residues can disrupt and destablise the solvating water network in the binding site. From its inception by Richard Cramer in 1988 to the more usable and efficient versions produced by Cresset, Molecular Field Analysis and MFA based QSAR, these techniques have been mainstays in the computational drug hunters arsenal. Using studies on Retinoids, Rxinoids, SARMS, and SGRMS the improvement of accuracy of these techniques are shown and compared to what information can be gleaned from structural studies. The utility of these approaches is shown. Harnessing the immune system via immune checkpoint blockade (e.g. anti PD-1, anti PD-L1, anti CTLA4) has led to fast and long lived responses in cancer patients. Response rates, however, are low and new treatments that enhance these rates are needed. Recent studies have shown that the administration of immune checkpoint blockers is associated with the overexpression of indoleamine 2,3-dioxygenase 1 (IDO1). The resulting immunoregulatory phenotype counteracts immune checkpoint blockade and allows for cancer progression. The discovery of IDO1 inhibitors, and the potential to combine them with immune checkpoint blockers, therefore, represents an attractive strategy to fight cancer. Over the past decade, the search for IDO1 inhibitors has been rewarded with the identification of potent and efficacious compounds. This search has also led to the discovery of inhibitors of the related protein TDO2 as well as dual IDO1/TDO2 inhibitors. However, the most advanced clinical candidates contain moieties that are potentially associated with high toxicity or drug-drug interaction risk. New scaffolds potently inhibiting IDO1 and/or TDO2 and with reduced safety risks, are therefore highly sought after. We used a truncated analogue of epacadostat (an IDO1 inhibitor entering phase III trials) as the starting point for our hit identification campaign, and calculated its preferred conformers using Spartan. These provided templates for a Blaze virtual screen of over a 1,000,000 commercially available small molecules performed by Cresset Discovery Services. The top in vitro hits were clustered and filtered based upon parameters including physicochemical properties and structural alerts, to provide 610 commercially available in silico hits. In vitro screening of these virtual hits resulted in the identification of structurally novel IDO1-selective, TDO2-selective and dual IDO1/TDO2 inhibitors. A subsequent Hit to Lead campaign led to the identification of highly selective IDO1 inhibitors with potency equivalent, or superior, to the IDO1 inhibitors currently under clinical investigation. As Computational Chemists, when you have got a set of hits for targets that do not have any known small molecule modulators and the pocket happens to be a protein-protein interaction site — what next? We apply ligand-based tools that include alignments based on 2D similarity, common pharmacophore features or structure-based tools like molecular docking to propose a testable hypothesis. Complementing such tools with Cresset field points that are representations of the small molecule’s surface electrostatics strengthens rational predictions. Ensemble-based drug design (EBDD) is an expression that was coined to capture the idea of modulating protein function via rational manipulation of protein-ligand structural ensembles. This talk will present an overview of a range of molecular simulation algorithms and software that our lab is developing to validate the feasibility of EBDD. Drawing on examples taken from an in-house ligand discovery program for Cyclophilins, I will outline our approach to combine molecular simulations with biophysical measurements to unlock new opportunities for ligand discovery. The use of large tangible models has a long history within both chemistry and biochemistry, perhaps most famously captured by Watson and Crick’s model of DNA. Room-sized ‘Kendrew’ models1 were popular within protein modelling and visualization in the 1950s/60s (prior to widely available commodity computational machinery), allowing researchers to understand the first protein crystal structures. Models like these have played an important role in chemical research, allowing us to visualize the design intricacies of complicated nano-architectures across both biology and materials science. I will discuss (and hopefully demo) the work we have carried out fusing commodity VR and GPU-accelerated HPC to design a new environment which allows (up to 8) researcher(s) to natively inhabit a fully interactive 3d virtual molecular simulation environment. Using wireless ‘atomic tweezers’, it is possible to fluidly chaperone a real-time research-grade biomolecular MD simulation in a fully co-located 3d space with surgical precision. This platform opens up a new domain of ‘interactive simulation’, allowing researchers to tackle a range of biomolecular design problems as they interactively explore dynamical pathways and conformational states in hyperdimensional biomolecular systems. I will discuss applications of our multi-person VR-HPC environment to understanding the fundamental kinetic mechanisms and dynamical pathways whereby small molecular ligands (e.g., a drug or substrate) dock with a larger molecular receptor (a protein or enzyme).4 Problems like this represent a sort of ‘3D molecular Tetris’, but are complicated by the fact that biomolecular systems are flexible objects with thousands of degrees of freedom and complex interactions. Glowacki, O’Connor, Deeks, Interactive drug docking using real-time MD within the Nano Simbox: https://vimeo.com/202556275. Chris Beadle received degrees in both Chemistry and Biochemistry from the University of Southampton in 2000. Immediately after completing his studies he joined Lilly as a medicinal chemist and has worked on projects in the areas of psychiatry, neurodegeneration, oncology and more recently diabetes. Named inventor on several patents, and with one molecule recently in clinical trials. Since 2011 Chris has dedicated a growing proportion of his time to supporting Lilly’s Open Innovation Drug Discovery Program as a regional ambassador for the program. In 2016, Chris took on a full-time role in OIDD with global responsibility for all of OIDD Automated Synthesis collaborations, and continues to seek new platform opportunities for external engagement. Kavitha is a computational chemist with expertise in the design and optimization for potent and selective small molecules in an interdisciplinary team working on drug discovery projects. She combines structure-based, ligand-based drug design methods with molecular dynamics simulations to propose realistic and testable models after justifying known experimental data. Kavitha analyzes HTS hits for commonchemo-types, builds structure-activity relationships, develops a working hypothesis, while accounting for the mutational effects, conformationalchanges, and substrate selectivity determining residues at the binding pocket. She works with medicinal chemists and manages the medicinal chemistry services. Kavitha has contributed to the drug discovery efforts at St. Jude Children’s Research Hospital, Tennessee, U.S.A on various anticancer targets as a postdoctoral associate. She applied and implemented tools to identify distinguishing residues that contribute to selectivity among related protein family members as a post-doctoral fellow at A-STAR, Singapore. She earned her PhD in the field of computer-aided drug design from Gyeongsang National University, South Korea. Jack Bikker received a B.Sc. degree in Engineering Chemistry from Queen’s University in Kingston, Ontario in 1989, followed by a Ph.D. in chemistry in 1994. His graduate studies focused on synthesis and computational studies under the supervision of Dr Donald Weaver. He then pursued a computational post-doctoral fellowship at Parke Davis Pharmaceuticals in Ann Arbor, Michigan from 1993‑6, working with Dr Christine Humblet and then did further post-doctoral training with Dr Andy Vinter at Cambridge University. He joined the Parke Davis Neuroscience Research Centre in Cambridge, England in 1997 as their molecular modeler, and moved within the company to Ann Arbor in 1998. He held various scientific and management positions within the Parke Davis and later Pfizer organizations in Ann Arbor, until discovery research was discontinued at the site in 2007. He joined Wyeth in 2007 as a computational chemist supporting the Pearl River, NY and Cambridge, MA sites, followed by an additional year developing antibody-drug conjugates at Pfizer Global Research and Development in Groton, CT in 2010. In 2011, he joined International Flavors and Fragrances to lead their Research Information Services group and initiate a modeling program. He is currently Director of Performance Insights, a role that encompasses chemical informatics, modeling, and fragrance and flavor performance testing. Mike did his PhD in molecular design for Nobel laureate sir James Black before taking up a fellowship in computational drug discovery at Cambridge University. He moved to AstraZeneca as a computational chemist before joining Eli Lilly in 2000. Since 2003 he was head of the computational drug discovery group at Lilly but jumped ship to Evotec in 2014 to work as the vice president of Research Informatics integrating cheminformatics, bioinformatics and omics approaches. His research aims are to continue to develop new algorithms and software in the fields of drug discovery and systems informatics and to deliver and apply current and novel methods as tools for use in drug research. Phil earned his PhD in Organic Chemistry at the University of Exeter (Professor Stan Roberts). Phil then moved to the USA for Postdoctoral Fellowships at Wayne State University (Professor Carl Johnson) and then CWRU (Professor Phil Garner). Phil then moved back to the UK in 1997 where he began his industrial career at Oxford Asymmetry International (now Evotec) where he was a Senior Scientist and then Project Leader in the Discovery Services Division, leading multiple collaborations in both the Pharmaceutical and Agrochemical sectors. In 2001 Phil moved to Pharmacia, Skokie, where he was a member of the Parallel Medicinal Chemistry Group before transferring to Ann Arbor as part of the Pfizer acquisition in 2003. After Pfizer closed Ann Arbor in 2007, Phil moved to Abbott Labs (now AbbVie Inc.) where he is currently a Senior Principal Research Scientist and FBDD Chemistry Group Leader in the Discovery Chemistry and Technology Department. Phil was recently appointed an Adjunct Professor of Chemistry at Washington State University. Phil is an inventor on numerous patents spanning multiple therapeutic areas and has published articles in the areas of property-based design, fragment-based drug discovery, and compound file management. Dr David Glowacki is a scientist and digital artist with appointments as a Royal Society Research Fellow at the University of Bristol, and visiting scholar at Stanford. In Bristol, he heads up an eclectic and internationally recognized research group between the Centre for Computational Chemistry and the Department of Computer Science. He is also a resident at Bristol’s Pervasive Media Studio, an interdisciplinary digital research lab that brings together artists, engineers, and scientists. His artistic work at the frontiers of scientific simulation, interactive computing, and digital aesthetics has been experienced by more than 200,000 people on three continents, and displayed at a number of prestigious cultural venues across the world, including the Barbican in London, the ZKM | Centre for Art & Media Technology in Karlsruhe, the Stanford Art Institute, the 2012 London Olympics, Bristol’s Arnolfini, and many more. The success of this work led him to found Bristol-based tech startup interactive Scientific Ltd. (iSci), who specialize in developing interactive apps and collaborative virtual reality platforms for molecular simulation and scientific education. He now serves as chief scientific consultant to iSci. Glowacki has published high-profile papers across a wide range of research domains, and regularly receives invitations to lecture at prestigious scientific and cultural venues across the world. Alexander Hillisch is a Director of Medicinal Chemistry and Head of Computational Chemistry at Bayer AG, Wuppertal, Germany. Since 2003 his team supports drug discovery efforts in cardiology, oncology and ophthalmology indication areas with computational chemistry, chemoinformatics, in silico ADMET and structural bioinformatics techniques. From 1998 to 2003 he headed the research group ‘Structural Bioinformatics and Drug Design’ at EnTec GmbH, Jena, Germany, a subsidiary of Schering AG, Berlin. There he was project manager in preclinical research and involved in the computer-aided design and pharmacological characterization of drugs against gynecological diseases and cancer. He is author of 42 research papers, 59 patents and 2 books. Alexander teaches ‘Molecular Pharmacology and Drug Design at the University of Cologne from which he received a honorary professorship in 2010. Adam brings over 25 years of computational chemistry experience to Retrophin. He received his Ph.D. in theoretical organic chemistry from UCLA, working with noted theoretical organic chemist Kendall N. Houk. He has authored multiple patents, 10 at Vertex Pharmaceuticals, with more being written. Adam has also supported many basic research programs that have led to pre-clinical and clinical programs. At Ligand Pharmaceuticals he led the Thromcytopenia program leading to LGD4665(Totrombopag). His expertise includes drug discovery in women’s health, anti-infective, metabolic diseases, neurological diseases, oncology and hematopoietic disorders. Adam is also considered to be an expert in the statistical analysis and graphical display of biological data. Adam is Director of Computational Chemistry at Retrophin Inc.
Julien Michel is a Royal Society University Research Fellow at the School of Chemistry, University of Edinburgh since 2011. His group pursues research in the development and application of molecular simulation methods to support structure-based drug design. Prior to that Julien was a NFCR and Marie-Curie postdoctoral fellow (2007-2010) in the laboratory of Prof. William Jorgensen at the chemistry department of Yale University (USA) where he pursued research in the field of computer-aided drug design. Julien previously completed a PhD student in computational chemistry (2002-2006) at the School of Chemistry of the University of Southampton. The research was performed under the supervision of Prof. Jonathan Essex, and funded by the pharmaceutical company Astex Therapeutics Ltd.
As CEO at Interactive Scientific (iSci), Becky Sage is visioning the future of science education and research. She has led iSci in the development of the state-of-the-art digital platform, Nano Simbox which is an interactive visualiser for molecular simulations, allowing researchers to manipulate and visualise models in 3D in virtual. Becky has won a National Women in Innovation award and was a WISE finalist 2016 for tech startups, sponsored by Goldman Sachs. This has shown to be of value in drug discovery processes. Prior to her role at iSci, Becky worked with innovative digital and scientific companies, with a focus on science research and education initiatives and how chemistry impacts global challenges, she has published policy papers and industry articles on this subject. She is very interested in the importance of multidisciplinary approaches to change-making activity. Becky regularly presents in industry and school environments, with many years’ experience of science outreach and education activities. She has a PhD in chemistry from the University of Bristol. Andy is the Founder of Cresset. His ground breaking research on new virtual screening technology formed the scientific foundation of the company and has underpinned our technical development ever since. He is dedicated to investigating realistic explanations for drug and hormone interactions on biological targets at the molecular level by computational means. 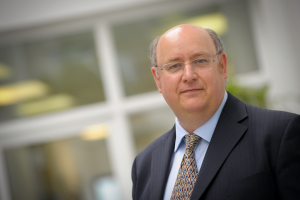 Andy has over forty years’ experience in the pharmaceutical industry with Beechams, Ciba, Maybridge, The Wellcome Foundation and SmithKline & French. Since 1990 he has been a Scientific Consultant and Honorary Research Fellow at the University of Cambridge and has held five Visiting Professorships including UCL, KCL and Utrecht. Dr Wade joined the management team at BioBlocks, Inc. in April 2008 to manage BioBlocks’ Lead Optimization collaborations. Dr Wade is the primary inventor of BioBlocks’ Leap-to-Lead™ platform and brings lead chemistry innovation, cheminformatics and the application of new technologies for lead discovery and optimization. Previously, he spent 7 years at Neurocrine Biosciences as a Director of Medicinal Chemistry where he advanced two small molecule candidates for Investigational New Drug (IND) filings. Prior to this, Dr Wade spent 8 years at Abbott where he was involved in developing the Company’s combinatorial chemistry program to maturity, and applied parallel synthesis and solid phase synthesis for medicinal chemistry. Dr Wade is an author of over 25 publications and a co-inventor on more than 15 issued US patents. He has Ph.D. in Bioorganic Chemistry from the California Institute of Technology (Caltech) and a BA in Chemistry from Cornell University. Chris is an EPSRC Research Software Engineering Fellow working in the Advanced Computing Research Centre at the University of Bristol. His background is as a computational chemist, originally working at the University of Southampton, before moving to the Centre for Computational Chemistry at Bristol. During this time Chris developed a range of new methods for calculating protein-ligand binding free energies using both classical and quantum methods. In particular, he developed WaterSwap, which allows absolute binding free energies to be calculated from a single simulation; and a range of software, including ProtoMS and Sire. Sire is a Python/C++ framework that supports rapid prototyping of new simulation methods, and is used as the foundation of the software used to perform WaterSwap calculations. Cambridge is a city on the River Cam in eastern England, home to the prestigious University of Cambridge, dating to 1209. 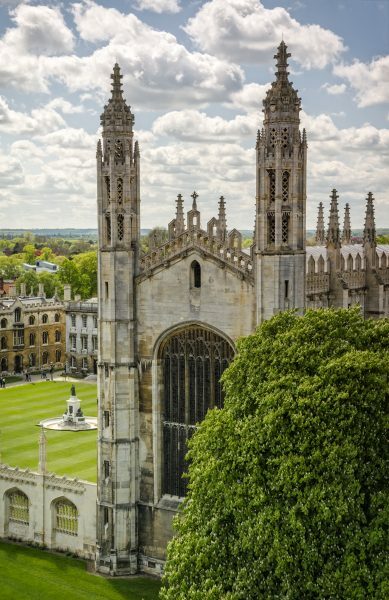 University colleges include King’s (below), famed for its choir and towering Gothic chapel, as well as Trinity, founded by Henry VIII, and St John’s, with its 16th-century Great Gate. University museums have exhibits on archaeology and anthropology, polar exploration, the history of science and zoology.